Welcome to the MTSU Center for Environmental Education's Four Season Virtual Tree Trail. The Virtual Tree Trail allows you to experience some of the sights and sounds of a walk through the woods. 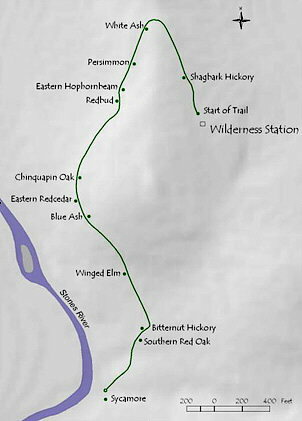 The actual trail on which this four season tour is based is at the Wilderness Station at the Barfield Crescent City Park in Murfreesboro, Tennessee. We hope that after learning about the trail and the trees that occur along it you'll want to actually hike the tree trail at the park and experience all of its natural wonders. Though we've tried to include as many sights and sounds as possible, you'll see and hear much more on a real trek through the woods. The Virtual Tree Trail is designed to enhance, not replace, your natural experience. 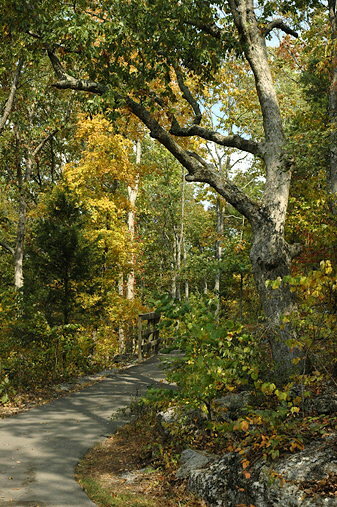 The Tree Trail at the Wilderness Station begins at the trailhead and follows the paved trail to the river overlook beside the West Fork of the Stones River. The Four Season Virtual Tree Trail of course follows the same path. Each of the twelve featured Station trees is marked by a interpretive sign mounted on a square wooden post about 2-1/2 feet high. The trail winds its way around a ridge dominated by limestone outcrops. The forest here is a dry upland oak-hickory forest. The plants and trees that grow here are called calciphiles; they prefer alkaline, well-drained soils. Twelve tree species are featured along the Virtual Tree Trail. You'll be able to stop at each of the twelve stations and look at the identification characteristics of each species in each season. If you like, you can click the link to the dichotomous tree key and key the tree out. The dichotomous tree key is designed to be used in along with the interactive illustrated glossary. While using the key, or on any other page, simply click any words that appear in blue to be taken to the glossary. Any words that appear in red are illustrated, and clicking on the word will take you to an illustration. The dichotomous tree key and the glossary can be accessed from any of the Virtual Tree Trail pages, and appear both in the body of the page and in the navigation bar at the top left of the page. After visiting the dichotomous tree key or the glossary, use the "back" button on your browser to return to the station that you were visiting. To navigate around the Four Season Virtual Tree Trail first select a season at the bottom of this page or from the choices on the navigation bar at the top left of this page. You will then be taken to the trailhead at that season to begin your tour. At the bottom of each page is a link that will take you to the next station along the trail. You can also use the navigation bar at the top left of each page to quickly move along the trail. At each station there are links below the navigation bar that will show you the station at each of the other three seasons. We recommend setting your speakers to a fairly low setting to listen to the natural sounds on the web pages. Louder sounds can be distracting. For each season, virtual calling animals were placed at various points along the trail, and your ability to hear them varies with your position on the trail. Sounds increase in volume as you pass each virtual animal and decrease in volume as you leave them behind. You may hear scolding notes as you pass by. Natural sounds are most numerous and varied in the spring and least numerous in the winter. All sounds used are identified on the Sounds Page. Directions to the Wilderness Station can be found at the Wilderness Station web site. Be sure to dress appropriately for the season, and stop at the trailhead to read the posted signs there. A pair of binoculars often comes in handy on the trail, both to see flowers and other structural parts high in the canopy and to see wildlife along the trail. A hand lens is another very useful tool to have. In a pinch, you can turn your binoculars around and look through them backwards to use them as a magnifying glass for small identification characteristics. Please always respect the habitat and stay on the trails. Since many people enjoy the trail, please do not remove or alter any leaves, twigs or other parts of the trees while you are there. Leave them so others may enjoy them too. Note that all images and recordings are copyright 2008 Leaps. Please contact Bob English at Leaps (www.leaps.ms) for permission to use these images and recordings. Information on inexpensive ways to record natural sounds can also be found on the Leaps web site. Laura McCall contributed much to the design, data collecting and interpretation phases of this project while she was at the Center for Environmental Education. Thanks to Cindi Smith-Walters of the Center for Environmental Education for her leadership throughout the development of the Virtual Tree Trail. Cindi wrote the Dichotomous Tree Key and collaborated on all parts of the web site. We would like to thank Deborah Paschall and the staff of the Wilderness Station for their assistance and for providing much useful information. Funding for this project was provided by a special grant by the MTSU Foundation, and we are grateful to have this opportunity to contribute to the natural interpretation of this beautiful site.